We wandered past Bock Biere a few weeks back and although we'd already eaten we were drawn in by an A-board outside advertising their moules to share, Belgian beer and if we're being completely honest, their nice branding too. Unfortunately the place was bursting out the door so we couldn't grab a drink but we vowed to book a table online and revisit another weekend. After looking online to book we were sidetracked by their 'Sunday Roast Fondue' so the mussels still have to wait for another day but who could say no to the idea of 8 hour slow cooked brisket, Yorkshire pudding waffles, roast vegetables & potatoes served with a pot of biere bourguignon lava gravy? So on a surprising sunny late September Sunday we heading into Manchester with a hungry appetite ready to devour our Sunday lunch with a twist. 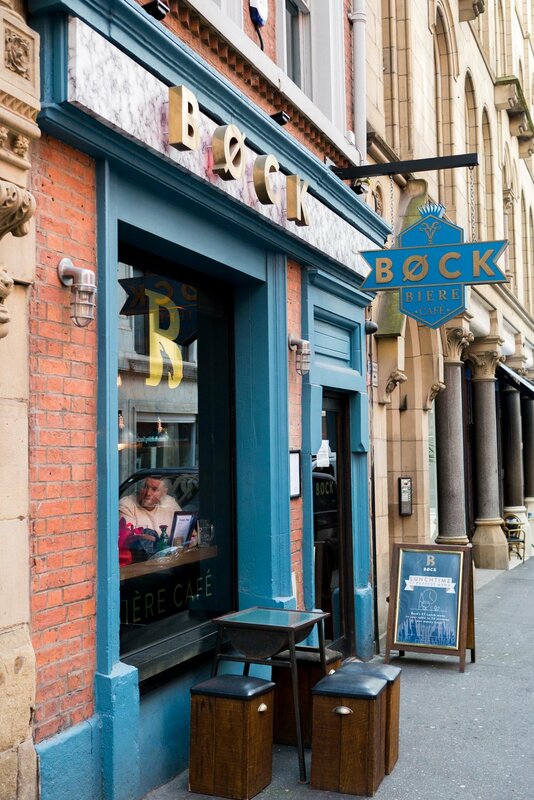 It's almost like walking through a portal when you step into Bock Biere as your instantly transported to the cosiest little Belgian bar and you could easily be forgiven for forgetting that you're still on a Manchester city side street. We opted for their signature German session lager to drink (aptly named Bock Biere if you didn't guess) but they've got 13 pages of ales, lagers and ciders both on tap and bottled along with a few carefully crafted cocktails too. The main event, the Sunday lunch, definitely didn't disappoint! Priced at £20 for 2-4 to share, you get an incredible amount of food and it's all as delicious as the rest. The 8 hour beef brisket is incredibly succulent and just falls away as soon as you touch it, plus it's served in its own serving of delicious gravy. The potatoes and vegetables are all still crisp and the perfect size to dunk into the rich fondue pot. 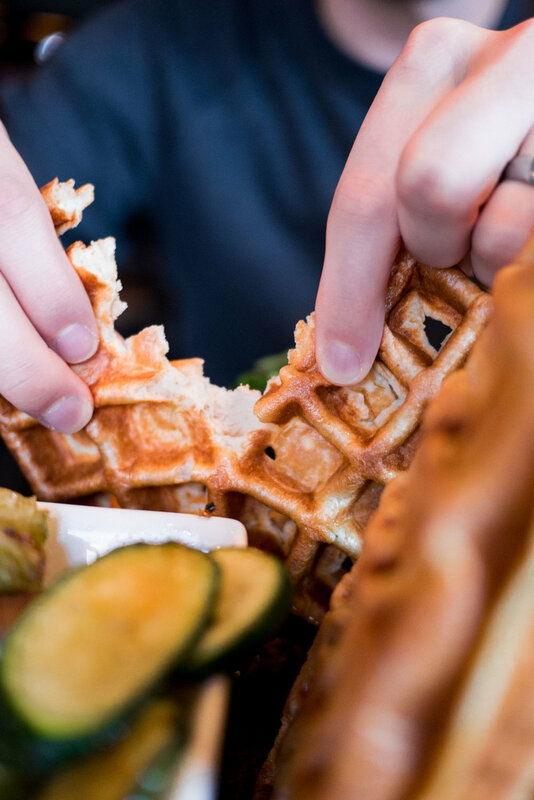 Oh and the show stopper Yorkshire pudding waffles are just that, the perfect looking waffle that tastes exactly like a Yorkshire pudding, it's a mind trip but 100% worth it and an idea that we'll be stealing for future dinner parties. The lava gravy bubbles away throughout your meal but you are given a spoon to put the flame out to prevent it from burning, it's an incredibly rich pot and probably the best gravy we've ever tasted, another thing we'll be trying to recreate at home! 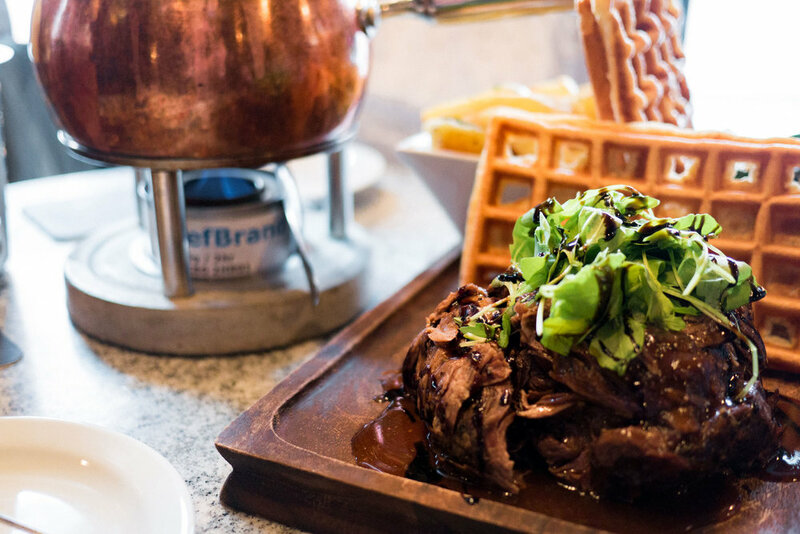 We'll be back to try out the moules frites and to try their cheese fondue too which comes with steak and cured sausage whilst the fondue is created using four cheeses, creme fraiche and Belgian beer, how perfect does that sound? If you fancy giving this place a go we'd recommend booking ahead as it does get extremely busy but it's worth the wait!